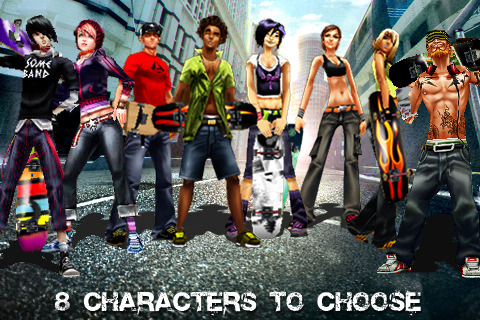 Skater Nation - Rule your board in Skater Nation and experience skateboarding in a way no other iPhone or iPod touch game can offer! Ride freely through an enormous 3D city and just have fun in the 10 different environments including beaches, residential areas and a skate park! Pick from 8 different skaters, each with their own unique animations and style. Then make the board your own at the Skate Shop where you can purchase a selection of 10 different decks, trucks and wheels. Every location is jam packed with ramps, pipes and posts for you to perform your arsenal of tricks on. Show off your ollies, 360 flips, nose grabs and more! More than 30 tricks are available! Ever perform the most amazing trick and wish somebody was there to see? 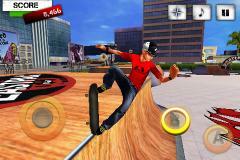 Save your replay and upload it to YouTube and discuss them on skaternationgame.com, then dare your friends to do better. Connect to Gameloft LIVE! and chat with your friends or show off your unlocked trophies. Enter the Career mode to discover challenges waiting for you throughout the city. Become part of a story that puts you in the middle of the skateboarding world. The benchmark of action stealth games on console is available for the first time on iPhone and iPod Touch!